Young people who are considering college majors, and their families, are often conflicted when selecting an appropriate course of study. Should the young aspiring writer choose a major like English, or something deemed more practical like computer science, nursing or business? Given the rising cost of education, it has been harder and harder for some to justify choosing a liberal arts discipline. Fortunately for those taking a sophisticated approach to this dilemma, there is some middle ground. The college student can combine liberal arts study in an area of academic passion with a more practical grounding via experiences like a minor, internship, volunteer experience, or graduate study. All of these pursuits enable a candidate to demonstrate to employers a genuine interest in a field and to document relevant knowledge or skills. The student who loves Victorian literature but has no plans to go on for a Ph.D. and teach might select a secondary area of study or interest. If the student enjoys writing, that might mean taking on a minor in communications or marketing. A psychology major might cultivate an interest in organizational/industrial psychology and choose a few courses in human resource management. The philosophy major intrigued by logic could take a few computer courses and try her hand at programming. A sociology major fascinated by social issues can take on a minor in public policy. A math major with an interest in the stock market will prepare for a career in quantitatively based trading by completing a minor in finance. Consider adding a full second major in a more applied field if you are up for the rigor. Taking on academic challenges proves that you are a hard worker. A double major gives you the opportunity to pursue a passion like anthropology that may not have obvious career implications while providing grounding in another discipline like information technology with a clearer connection to a career. A physics major with an interest in teaching might volunteer as a tutor. A sociology major with an interest in counseling can take on positions as a resident adviser, peer counselor or student orientation volunteer. An English major interested in communications could work for the campus newspaper, magazine, radio or television station. A biology major interested in public health might volunteer as a peer health adviser. An economics major interested in finance could run for club treasurer or student government finance officer. A math major with an interest in technology could get a job assisting other students at the campus computer labs. A psychology major interested in event planning might take on the role of social chair for her sorority. Employers of all sorts are interested in potential leaders when hiring college graduates. So, taking on any campus leadership position, such as club president or student government officer, where you can document a positive impact on student life can enhance your resume effectively. If you see a need on your campus and start a new club, employers will view you as an impact person who takes initiative. Reach out to the career office and department faculty at your school to obtain a list of graduates who majored in your discipline. Ask for contact information and job titles so you can reach out to alumni working in interesting fields to conduct informational interviews. Ask these individuals how their major helped prepare them for their current career. In addition, be sure to ask them about the other experiences or coursework which were critical to their career development and enhanced their marketability. Students who can articulate a clear rationale for their interests will have a much better chance of being hired for a job that is not obviously related to their major. An economics major with a banking internship or experience as a teller is a much different and more attractive candidate for finance jobs than the plain economics major. Even some high school students are completing internships now, so it is never too early to start. Meeting alumni, friends of the family or local professionals for information and advice can lead to internships once they get a chance to know you. Contact the career office at your college and speak with your department faculty for assistance and to access listings of internships. Even basic summer jobs like an office assistant for a marketing firm or camp counselor can highlight an interest in a field and showcase your work ethic. Students who have always worked and even juggled multiple jobs will often be viewed as attractive prospects by employers. You will often be given leeway from professors regarding the topics of your papers and course projects. By selecting topics that relate to your career interests, you can demonstrate to employers a sincere interest in a particular role or industry. For example, if you have an interest in working for a political consulting group, you might choose a topic like the impact of social media strategies on political campaigns as part of a political science course. A student with an interest in marketing who is taking a social psychology course might undertake an analysis of the impact consumer attitudes have on purchasing patterns. Senior theses and independent studies are excellent mechanisms for showcasing an intellectual interest in a career field. Career-related projects and independent studies can be listed on your resume and referenced during interviews as proof of your related career focus. The combination of a liberal arts major with a professional degree enables many graduates to access lucrative and satisfying career paths. 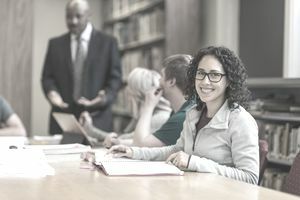 Combining a professional degree with a liberal arts major allows students to pursue academic and intellectual interests at the undergraduate level with the assurance that they will gain solid career preparation through graduate study. Most professional schools place a high value on a strong liberal arts preparation when screening applicants’ transcripts. So, a math major with an interest in finance might go on to get an MBA. An English major who loves books might acquire a master's in library science. A biology major with an interest in health issues might complete a program in public health or become a physician's assistant. A foreign language major might go on to study international affairs, and a philosophy major could go to law school. Review these questions to ask yourself before making a decision on going to grad school. Students who complete service programs while in college or afterward through programs like AmeriCorps or the Peace Corps demonstrate maturity and a seriousness of purpose to prospective employers. In addition, if you are interested in helping or in public service careers then volunteering can add skills and qualifications to your background, and show your dedication and caring. Following your intellectual and academic passions is more likely to lead to a record of superior achievement. Employers prefer candidates who can prove that they have been successful in their major pursuits within the academic realm, and in their activities or internships. Liberal arts graduates who can demonstrate a commitment to excellence will generally be highly recruited by employers.